When you marry into a family who makes literally the best sugar cookies you’ll ever eat in your life, you must tread carefully about trying to revamp the recipe to be allergy friendly. In the end, I only made one batch of sugar cookies because my husband and my children declared my recipe to be a success, which was good because we spent many hours baking very large batches of three different type of allergy friendly cookies this weekend, and I didn’t want to have to make any more! 1. Use wax paper to roll out the dough. Simply cut a sheet that overlaps around a large cutting board or piece of cardboard and tape it down. Then when you sprinkle your flour over the wax paper, your dough won’t stick to the board. 2. Use sifter to put flour onto your cutting board and rolling pin. If you sprinkle it on with your fingers, you’re more likely to clump the flour in places which then get stuck to your cookie dough. 3. Use a long, thin metal spatula to periodically release your dough from the board while you’re rolling it, and before you use your cookie cutters, be sure to go completely under the entire rolled out piece of dough so that your cookies won’t stick to the board when you’re cutting the shapes. 4. Invest in some smaller cookie shapes which you can use to cut little cookies from the dough left after you cut out the big cookie shapes. This cuts down on the amount of dough you need to re-roll. Put one cookie sheet aside specifically for the little cookies, which you fill up as you go along and then bake at the end. 5. Make sure your dough for rolling is very cold and firm. Most recipes will tell you to chill for an hour, but in reality you’re better off planning ahead and chilling your dough for several hours or overnight. When you’re making the cookies, be sure to put the dough back into the fridge in between scooping out new dough to roll. 6. Put all your re-roll dough into a small bowl which you then put into the freezer while you’re finishing up the regular dough. This will make the dough firm enough for you to re-roll immediately as opposed to having to wait for it to firm back up again. 7. Make your own colored sugars. Put 1/4 cup of sugar into a bowl and add two to four drops of food coloring. Carefully work the color into the sugar, using the back of a spoon to continualy “spread” the color completely into the sugar. You can store extra, leftover sugar in a sandwich baggie for a very long time! 8. Use parchment paper to line your cookie sheets. Your cookies will never stick. You won’t have to clean the cookie sheets. And you won’t have to worry about cross-contamination of your cookies. I usually use the If You Care brand. The parchment sheets can also be re-used over and over again on one cookie sheet. 9. Be sure to completely cool your cookie sheets before putting new cookie dough shapes onto them. I usually pop my cookie sheets into the freezer for a minute or two after removing the cookies. Works like a charm. 10. Invest in metal cookie cutters which you can use year after year. When you’re cutting out the shapes, put a pan of flour in the center which you can dip the cutters into so the cutters won’t stick to your dough. 11. When you’re done with your cookie cutters, fill the sink with hot, soapy water and just let them sit for a while. You’ll be able to simply rinse them off without having to try to “clean” the crevices. Then pop them (as long as they’re metal) onto one of your cookie sheets and place the cookie sheet in the oven which is turned off and cooling down. The residual heat will evaporate all the water, and your cutters will be sterilized and ready for next year’s use. 1. Mix the sugar with the sour cream and butter until well blended. 2. Add the eggs, one at a time, and blend well. Add the nutmeg. 3. Add in the gluten free flour, a cup at a time, only as much as you need to make a soft dough. Blend well. 4. Cover the dough tightly with plastic wrap and chill overnight, or at least for several hours. 5. Preheat the oven to 350 degrees. Line cookie sheets with parchment paper. 6. Line a board with wax paper. Sprinkle the board and a rolling pin with flour of your choice (I used brown rice flour), and roll out small amounts of dough to a very thin thickness – thin enough to make a crispy cookie but not so thin that you can’t actually move the cut out dough to the cookie sheet. 7. 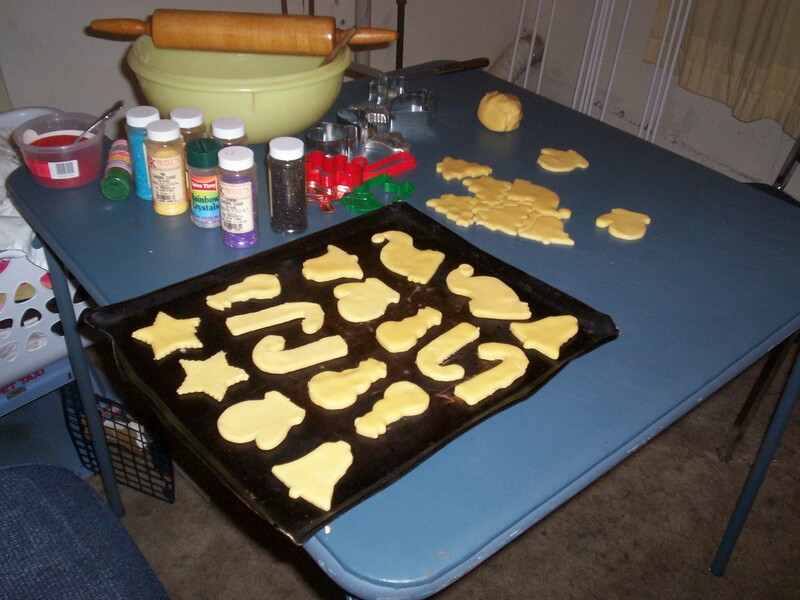 Cut out shapes with cookie cutters and place on the prepared cookie sheets. The cookies will not spread a lot so you can put them fairly close together. 9. Bake in the preheated oven for 8 to 12 minutes. Start with 8 minutes and then go up by 1 minute increments. (It really depends on how thin you are able to roll them in terms of how long the baking time needs to be.) The cookies should be dry, crisp and slightly puffed. 10. Let the cookies cool for a minute on the cookie sheet, and then move the cookies to a wire cooling rack and cool them completely. Once cooled, they’ll be nice and crispy sugar cookies. If you eat them while they’re warm, they’ll be chewier. 11. When the cookie are completely cooled, store them in a tightly covered container. They’ll last for a few weeks, though after a couple of weeks, they’ll get a bit softer.